Corner view of building housing Lighthouse Restaurant. 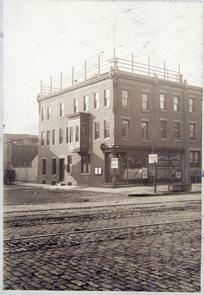 Three-story building with rooftop deck. "Oysters" sign on the building. Horse carriage and streetcar tracks on street.